There is a certain level of intimacy in everything we do, everything that we share with other people, every time we turn our thoughts or our gaze to another person. This intimacy has nothing to do with sexual attraction, with romantic, with a move in one or another direction, but all to do with a sharing of something special between two people, between kindred souls. Far too often it is misunderstood, questioned, even attacked as being inappropriate, anti-social, or any number of other excuses thrown out by those who do not understand the many different levels of life, experience, society. It is possible to have an intimate moment without exchanging a single word, a passing moment of realisation, perhaps, that there is a connecting interest, and it is gone again. We are, normally, very social animals, building a society exclusively based on connections, shared interests, loves and hates, and intimacy on every possible level cannot be ruled out, otherwise the whole simply would not work. We would be individuals sharing nothing, alone, lost, doomed to isolation. For some there is also intimacy in their surroundings, in the objects which mean something to them, which are part of their daily lives: perhaps an intimacy which has gone beyond the new and into the mires of normality; an intimacy which has progressed to nothing more than a presence hardly noticed until it is no longer there. The idea of intimacy brings most people to the wrong idea about what it is, about how they should handle it. An intimate word between two people is the sharing of a secret – a secret from other people, not necessarily more than that – a whisper of caution, a hint for the future, a reminder of the past. There is intimacy in a word of praise, as one person sees and appreciates an action or event, allowing it to change them in some small way, and lets the other know of this change, this impression which has been created within them. A book can be an intimate moment between author and reader, without them ever having met, as it shares the thoughts and dreams of the one – or their fantasy – and that without either one knowing the other, with one side, the author, not even knowing that the reader exists. Intimacy is not a romance, not a sexual awakening, not anything more than a moment shared, and left behind within our memories. Those who see intimacy as only a romantic connection, or as only a sexual connection, are missing out on understanding much more in life by relegating personal feelings and appreciations to a lesser level, by pushing down emotions and experiences and denying them their true worth. It is difficult for me to find a fitting description of myself as I rarely give it any thought. There are those who are constantly interested in improving themselves in the vision of other people: that is, they wish to be seen and appreciated for what they believe themselves to be. Some call this narcissism, ego, vanity, whatever. I am of an age that it makes no difference, I have no one I need to impress with titles and achievements, with appearances, fashion, additional competences. So I rarely give much thought to how other people would see me, how they would wish to see me, how I would wish to be seen and this, in turn, makes it difficult for me to assess what is important to another person, what they wish to know about me and what would be of advantage to tell. For those with any level of patience, reading my letters builds up a gradual, but full, picture over a longer period of time, and allows someone to see how thoughts and actions change, how experience form opinions, how an event can alter perspectives. For anyone to say they are of a certain and set opinion is all fine and good, but that opinion might change five or ten minutes later as new information is received, and placing it down on paper, this original thought, is merely a record of what was, not what is. So, as frustrating as it may appear to some people, there is method in my madness, in the reasoning behind my lack of personal description, and the hope that a longer relationship – based on the same lines as those of intimacy, with its broad range of connotations – will allow both parties to reveal themselves, to read and accept the other and, eventually, form an understanding which, over the further passage of time, is enhanced, changed, reformed, constantly flowing like water under a bridge. You note this, of course, by recalling your own changing interests – be they medieval torture devices or the writings of an Enlightenment professor – and how the hopes of the past change as each day passes, as new possibilities present themselves and, of course, temptations. Does anyone truly have regret? I believe so: I think there are many who look back on their lives, when the time comes for reflection, and wish they had taken a different path, said something else to a loved one, gone left instead of right at a crossroads. But we make our choices – mostly – at the time, and often forget, in later years, what was involved in making those choices, all the differing factors which we considered, accepted or discarded. Anyone can be wise after the fact, but few can see all the possibilities – the good and the bad – when they are right in the middle and cannot judge everything, cannot see everything, cannot rise above the whole and look down across an entire playing field to see what is over the horizon, what someone else might do, how another person is likely to feel or react to our actions. Regret should be saved for those times when we could not be bothered to do something, when we were lazy or too set in our ways to change, and suffered a loss or a setback as a result. I, for example, could regret my current position, the fact that I spend the whole day at home, in my small library, reading and writing rather than working as I used to. I could regret not being a part of the nine-to-five, the commuters, the people who look out of office windows or across the factory floor. Admittedly, I was never one of those, never in a factory or an office with such rigid working times, but that is most certainly something I will never regret. It is the action of another person, someone I could not have taken into account when I arose that morning, over which I had and have no influence, which places me here, which restricts me, which has confined me to a position I would never have chosen for myself. What, though, would be the point of this regret? It would have a point if I did not – speaking metaphorically for everyone in the same position – bother myself to take advantage of this setback and do something else with my life, with the few years I have remaining to me. A lack of action, of taking advantage of the changed situation would be good cause for regret, because it is something where I can influence events: the cause is outside of my control, but what follows depends on me. And, perhaps, your situation is much the same: the cause is completed and a part of history, it is what you make of the situation now, how you handle it, which advantages you take from it, which makes the difference, which belies any regrets you may later have. To be able to say: I did my best despite adversity, despite the fact that I could have settled back and done nothing, and I made something of my time. There have been many recent cases of a verdict, of evidence in a judgement being revisited, and an error corrected. I read recently of a man from Chicago who had spent many years in prison for a crime he did not commit, and the DNA evidence finally released him. I also read of cases where evidence is there, clear and available, and hidden by the unscrupulous who wish only to have a successful prosecution, regardless of right and fairness. I wonder whether they, those who have falsely prosecuted, ever have regrets. I know the answer, of course: they regret their actions only then when they are caught and brought before the courts to answer for their crimes themselves, and that, sadly, is a rarity. But the man I read about from Chicago was released, accepted back into the community, and given his old job back. Most are not so lucky. It impresses me more when a person can come out of such a situation and accept their new life as a new beginning, and not a collection of memories which sour and ruin the rest of their lives. They have understood something most people are incapable of grasping: we cannot change the past, no matter how much we complain. It has happened, it is there, it will always be there. We should accept it, turn to the future with our experiences, our knowledge, our new understanding in mind and begin afresh. How can anyone take advantage of the present, go into the future, when their mind is still caught up with the injustices of the past? That said: those who bore false witness should be called up for judgement, and it makes no difference to me whether they have the highest position in the land, or are the oldest inhabitant, and account must be given, justice must be done. My own reading is taking its usual twists and turns at the moment, partially because I am involved with a few other things, and partially because I have been faced with book recommendations which turned my mind in new directions. My lighter reading, having just finished another novel yesterday, is tending towards Ian McEwan and his wonderfully evocative works which take me back to my childhood, to y formative and teenage years. He writes, in Sweet Tooth, of the Seventies in London, of Camden Town and Chalk Farm – areas in north London where I lived – of a bookshop I regularly visited, of places which immediately conjure up images in my mind. My images, as with his story, are from the Seventies and not that which a modern reader, a younger reader perhaps, would call forth. The whole area has changed – for the better, for the worse, it makes little difference, we all change – and is no longer that which I remember. I needed the retreat into a world of the past to recover from an attempt to read Enlightenment Now by Steven Pinker, which I had assumed, from its name at the very least, to be a work on philosophy; whether set in the times of the Enlightenment or laid over our modern society makes little difference, it was a disappointment. There was, of course, much that I recognise covering poverty and the distribution of wealth, the golden times which were, and the standard of living we now enjoy, but also much which exasperated. The arrogant idea he puts forward that the world would have crumbled and destroyed itself but for the advent of humankind is something I can never accept, and for which there is no evidence. It seems to me, but not to him, that the world did remarkably well in the four billion years before Homo sapiens began roaming the Earth, and could have continued more than adequately without us. Aside from the memories which McEwan evokes in me, of a time I do not necessarily need to revisit, there are other memories which have been brought forward with your own missive, and which are not so much memories as continuing traits through the wanderings of my life. 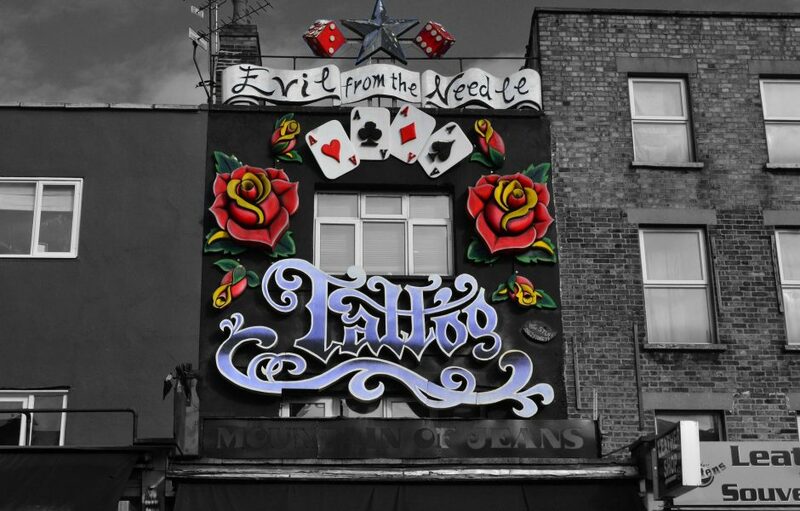 Living in Camden Town, in Chalk Farm and Hampstead I had access to some of the most fascinating portions of society imaginable. They ranged from those who could afford, and had, their own villa within grounds and surrounded by high walls, to those who lived and worked within the massive confines of old storage houses alongside the towpath of the canal in Camden. In the New York of the Eighties there were communities of artists who took over abandoned buildings and created lofts – what I would call communal studios, since a loft for me, with my British English understanding of the word, is an area under the rafters, an attic which has been converted, and not an entire floor – in Camden these were studios and occupied by a wide range of interesting people with artistic ideas, as far as they were concerned, but generally no buying public. They were graded, you could say, moving from the squalor of one area gradually into the acceptance of another which, over years and with a calming down of the artistic urges many claimed were the future of all creativity, brought them not only a viewing public outside of their immediate circle of friends, but an income through the purchasing public. I am pulled back into these times, long ago, by your picture and, through this art, revisit a time when I actively sought out original works of art in London and imagined, in my own small way, that I could collect and enjoy such works through the rest of my life. Of course, my finances never allowed such excursions, but I did manage to amass a small gallery of pencil sketches, of pen and ink drawings and watercolours. One or two original prints came with these, and it is only the prints which I still have, after many, many years of travelling. Those works which were framed and ready for hanging in the castle I once planned would be my home – although a simple manor house would have sufficed – had to disappear as I moved from one country to the next, and the trouble and expense of a complete household moving with me brought reality into the ideas and longings. But there came a time in my earlier life when I had to choose between the three things which interested me most, and stride on into the future. I had my art, a large collection of music on vinyl and my books. I chose the books and some of the art, but only because the latter was easy to transport, and that which had been went elsewhere, hopefully to good homes. Now, settled but still not financially secure, I look at my library with no regrets whatsoever, even though many of the books I had back then have also departed for other shelves – which could be regrettable, considering what some of them were – but the artworks are beginning to come back in and, in some of the rooms here, there is little wall space for more. My leisure room, which is next to what I call my library but has just as many books in it, has every free space covered with paintings, prints and sketches as if it were a Victorian art gallery. And I welcome your work of art to my small collection with one small caveat: that you should continue to draw and to express yourself through works of art as much as through the written word. For heaven’s sake, my heart, keep secret your love, and hide the secret from those you see and you will have better fortune. He who reveals secrets is considered a fool; silence and secrecy are much better for him who falls in love. For heaven’s sake, my heart, if someone asks, “What has happened?”, do not answer. If you are asked, “Who is she?”, say she is in love with another and pretend that it is of no consequence. For heaven’s sake, my love, conceal your passion; your sickness is also your medicine because love to the soul is as wine in a glass – what you see is liquid, what is hidden is its spirit. For heaven’s sake, my heart, conceal your troubles; then, should the seas roar and the skies fall, you will be safe. My freedom has been restored; will you now accept me as a willing companion, who looks at the sun with glazed eyes and grasps the fire with untrembling fingers? Your version is from the Dedication written by Gibran (to M.E.H.) and appended to A Second Treasury of Kahil Gibran and seems to be a mixture of several poems he wrote, the untrembling fingers appearing several times in his writing. Aside from reading books and the pleasures involved with receiving and replying to letters, I have been spending some time exploring the many offerings of the Theater Bremen, in Bremen. I came across their normal fare many years ago, but not that which goes on behind the scenes or, perhaps better, away from the main stage area. Then, about three weeks ago, I attended a rehearsal for a new modern dance production in their small theatre – the rehearsal being in a separate practice room hidden within the depths of the theatre itself, there where the walls are not painted and the heating comes from original stoves! We were a small group in this bare room hidden away from the public, and entertained by a short portion of the whole production. Seven dancers with part of the planned stage decoration and extracts from the, not quite completed, music. A glass of sparkling wine to keep us all happy and then conversations about what we had seen, what we imagined we had seen and so on. Although I am far from being in tune with modern dance of this sort, I did manage to mumble a few words which, it seems, went down reasonably well as I am now friends with a few of the dancers, and the producer of a piece planned for next year wishes to use me in the production, mainly because of the character of my voice. I went to the opening night of the production too, of course, and even stayed on for the party afterwards, which was an enjoyable and different experience. I was on stage for a while, in several productions, in the Seventies, and even considered a career in the theatre in the Eighties, but other things – especially books and travelling – came my way and the idea was shelved. I hardly imagine that this interest in my voice, or my now several visits to new productions at the Theater Bremen, will be the start of a new career for me, but it is fun nonetheless. And they have a remarkably good foyer café which always seems to be full of people even though it is well hidden from the main streets around the theatre. One experience from this foyer café is worth recalling. It is a foyer café because the entrance to the small theatre is on one side, as well as doors through to the working areas of the theatre and the offices above. On one of the first evenings I was there, tucked in a corner reading my book and waiting for the chance to visit a rehearsal, the youth dance group had a special show of their works. This is not a theatre production, and has no set form as such, but an exhibition to raise some money for the group, through entrance fees and tickets, and perhaps convince people to sponsor their work. The foyer area was reasonably empty until about fifteen minutes before this presentation was due to take place, and then it filled rapidly. People bought their tickets quickly and moved towards the doors, which remain resolutely closed. Then a bell sounded, the doors opened, and about one hundred and twenty people surged into the auditorium so that the foyer area was cleared in about five minutes. No waiting about, chatting, checking in of coats and hats: zap, gone. One of the strangest theatre experiences I have ever had but, apparently, absolutely normal for this type of show. It seems that the artists performing do their warming up routines on stage, take their positions, and wait while the audience pours in. It has to be quick so that they do not cool down again, so that their muscles are still supple. I’d like to be in the audience for one of these shows, but, at the same time, feel a spark of fear at the thought of an elephant stampede to find a seat!